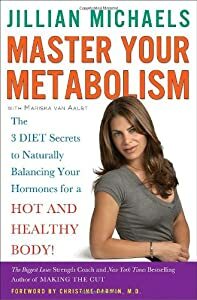 I was very impressed with Jillian Michaels’ New York Times bestselling book Master Your Metabolism: The 3 Diet Secrets to Naturally Balancing Your Hormones for a Hot and Healthy Body! The book is extremely well researched, well written and embraces the philosophy of hormones and your weight. Jillian Michaels, star and personal trainer from NBC’s “The Biggest Loser,” describes her battles and frustrations with her own weight and how she overcame them and became a role model for countless people. She discusses the interaction between hormones, nutritionally incomplete dieting and environmental toxins and how to overcome these problems following an approach similar to my books The Leptin Boost Diet: Unleash Your Fat-Controlling Hormones for Maximum Weight Loss and Hormonal Balance: Understanding Hormones Weight and Your Metabolism. Jillian does an outstanding job explaining the various hormones that affect your body weight and metabolism and offers clear and simple solutions for many types of hormonal imbalance. She also identifies the importance of good medical care and consultation with a board certified endocrinologist for many conditions. I was honored that Jillian referenced my books more than ten times and even referred to me as “the guru of all things hormonal” on page 78. Master Your Metabolism, along with my books are important resources for anyone who wants to better understand and overcome the challenges of hormones, metabolism and your weight.